Nevan Krogan (left) and Manon Eckhardt (right) connect the dots between human papillomavirus (HPV) and smoking-related cancers. Human papillomavirus (HPV) is widely known to cause nearly all cases of cervical cancer. However, you might not know that HPV also causes 70 percent of oropharyngeal cancer, a subset of head and neck cancers that affect the mouth, tongue, and tonsils. Although vaccines that protect against HPV infection are now available, they are not yet widespread, especially in men, nor do they address the large number of currently infected cancer patients. Patients with head and neck cancer caused by HPV respond very differently to treatments than those whose cancer is associated with the consumption of tobacco products. The first group generally has better outcomes, with almost 80 percent of patients surviving longer than 5 years after diagnosis, compared to only 45–50 percent for patients with tobacco-related cancers. To better understand what might cause these differences, a team of scientists led by Nevan J. Krogan, PhD, senior investigator at the Gladstone Institutes, is taking a unique approach by focusing on the cancer-causing virus. They recently mapped the interactions between all HPV proteins and human proteins for the first time. Their findings are published today in the journal Cancer Discovery. 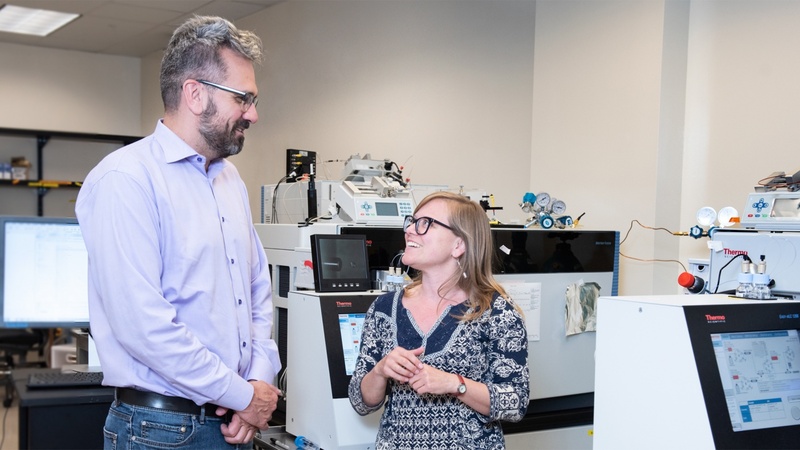 Krogan and Manon Eckhardt, PhD, a postdoctoral scholar in his laboratory at Gladstone, developed an integrated strategy to identify all the interactions between HPV proteins and human proteins. First, using a method called mass spectrometry, they discovered a total of 137 interactions between HPV and human proteins. Then, in collaboration with computational biologist Wei Zhang, PhD, in the laboratory of Trey Ideker, PhD, at UC San Diego School of Medicine, they looked at entire networks of each protein—rather than only individual proteins—to detect the most important players. They also compared their list of proteins with data from HPV-associated cancer samples published by The Cancer Genome Atlas project. This large consortium catalogued genetic mutations in tumors of various cancers. By overlaying the protein interaction and genomics data, the scientists discovered that the HPV virus targets the same human proteins that are frequently mutated in smoking-related cancers. Interestingly, those proteins are not mutated in HPV-positive cancers. For example, their findings reconfirmed a well-established interaction between the human protein p53 and an HPV protein called E6. In HPV-negative cancers (those related to smoking), p53 is mutated in nearly all cases. However, the same protein is rarely ever mutated in HPV-positive cancer patients. In smoking-related cancers, p53 is mutated, which causes the cancer. Instead, in HPV-positive cancers, the viral protein E6 interacts with p53 and inactivates it, resulting in the same cancer, but without the mutation. This suggests the establishment of the viral infection and the development of tumors share common pathways. Eckhardt showed that the HPV protein E1 interacts with the human protein KEAP1, which is often mutated in smoking-related cancers. In HPV-positive cancers, KEAP1 is not mutated. But, through its interaction with the protein E1, KEAP1 is inactivated, which helps cancer cells survive. The researchers also found that the HPV protein L2, which is part of the virus’s packaging, interacts with two human proteins called RNF20 and RNF40. They demonstrated that in HPV-positive cancers, this protein interaction increases the tumor’s ability to spread and invade new parts of the body. These results confirm that the HPV virus causes head and neck cancer by targeting the same proteins that go awry in response to smoking-induced mutations. Krogan and his collaborators have shown that integrating HPV–human interaction with tumor genome data, and focusing on genes that are mutated in HPV-negative but not HPV-positive tumors, constitutes a powerful approach to identify proteins that serve as both viral targets and genetic drivers of cancer. The scientists’ work should lay the groundwork to find better therapeutic options for both HPV-negative and HPV-positive head and neck cancers. In addition, Krogan’s long-term goal is to define a pipeline that will enable the study of many other virally induced cancers, including those linked to Hepatitis B and C, Epstein-Barr virus, and adenoviruses. The paper “Multiple Routes to Oncogenesis are Promoted by the Human Papillomavirus-Host Protein Network” was published online by Cancer Discovery on September 12, 2018. The research was supported by the National Institutes of Health (grants U54 CA209891 and P50 GM085764) and the Tobacco-Related Disease Research Program. John Von Dollen, Kathleen E. Franks-Skiba, Gwendolyn M. Jang, and Priya S. Shah from QBI and UCSF contributed to this study, as did Jeffrey R. Johnson and Danielle L. Swaney who also work at Gladstone. Other authors include Tasha L. Johnson, Toni M. Brand, and Jennifer R. Grandis from UCSF; Andrew M. Gross and Jason F. Kreisberg from UC San Diego; and Jacques Archambault from McGill University.